Wire your vehicle and get the signal lights required for flat towing without having to splice into your wiring with this custom, plug-in harness. Integrated diodes prevent feedback from RV for safe operation. Wires as combined lighting system. 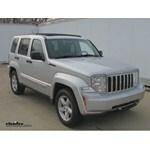 Lowest Prices for the best tow bar wiring from Hopkins. Hopkins Custom Tail Light Wiring Kit for Towed Vehicles part number HM56204 can be ordered online at etrailer.com or call 800-298-8924 for expert service. Wiring your car for flat towing has never been easier. No more testing wires or splicing into your electrical system. No need to painstakingly position multiple diodes beneath your vehicle. No worries about voiding your warranty. 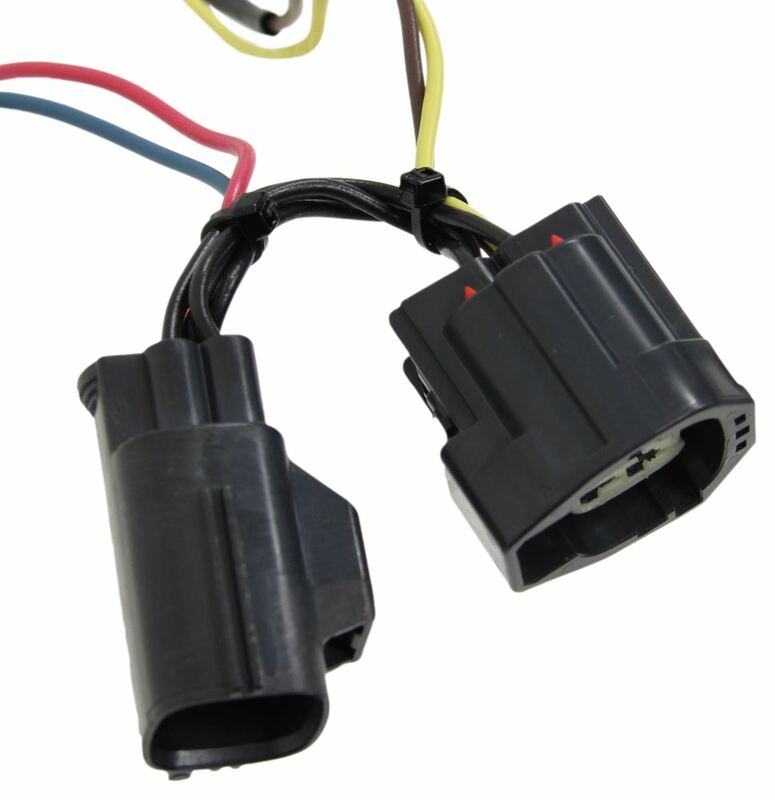 With this custom-fit towed vehicle wiring kit from Hopkins, all you have to do is plug the harness into your vehicle's existing wiring, which is located behind your car's tail light assemblies. No cutting, tapping, or splicing is required. 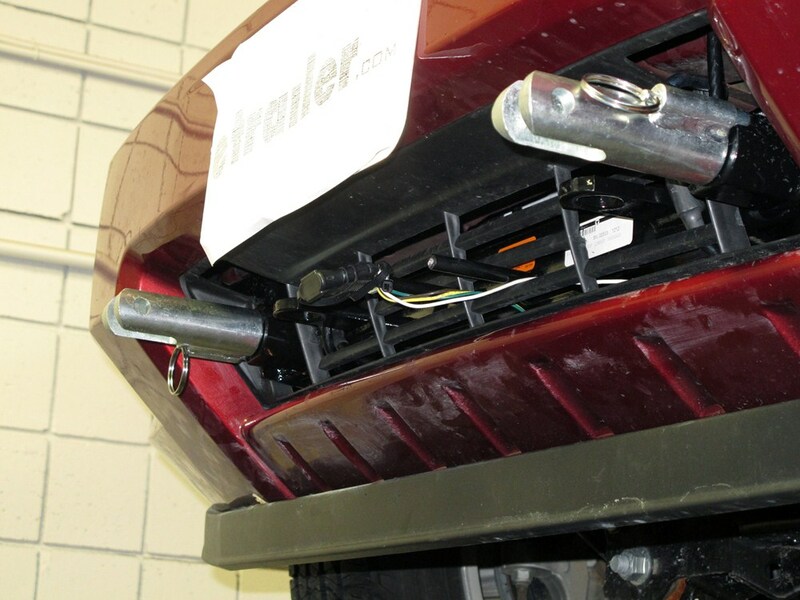 After plugging in the wiring harness, use the included bracket to mount the 4-way flat connector at the front of your towed car. An extension loop (sold separately) is required to connect your towed car to your RV. Your vehicle ordinarily operates on a 3-wire system, wherein the brake signal and the turn signals travel along different wires to illuminate different lights. (Typically, this means that your vehicle will have amber turn signals.) This is referred to as a "separate lighting system." When you hook up for flat towing using this harness, however, your towed car's lighting system will operate in a combined fashion. This means that the brake and turn signals sent by your RV to your towed car will be carried on a single wire. As a result, your car's brake lights will do the flashing for the turn signals. Your vehicle will still function as designed - with separate lighting - when not hooked up to your RV. 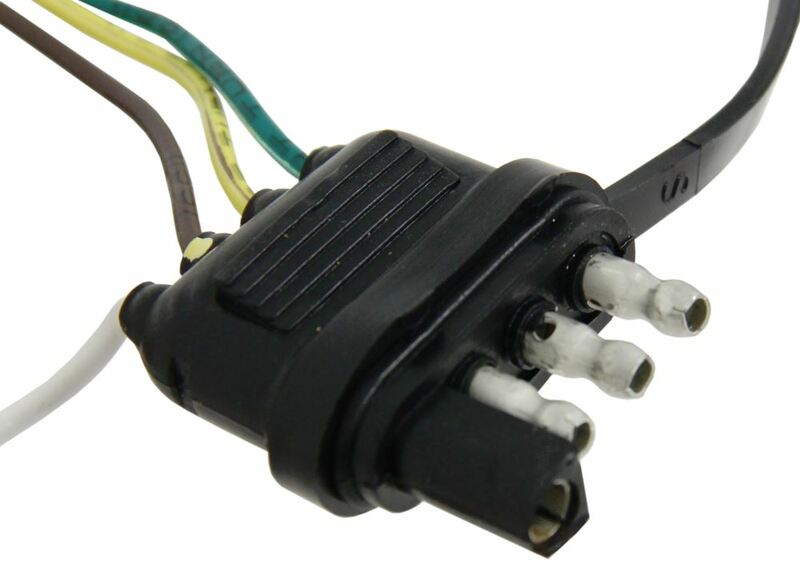 Do You Need a Brake Light Relay? 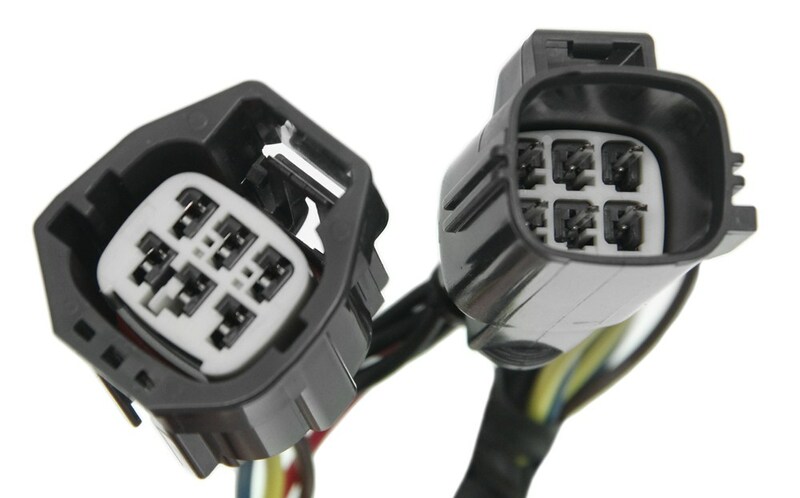 Because this harness wires your vehicle as a combined system, a brake light relay (RM-88400 - sold separately) may be required if you use a supplemental braking system with your towing setup. A supplemental braking system depresses the brake pedal in your towed car every time you apply the brakes in your RV. So, if your towed car's brake lights illuminate when the brake pedal is pressed and the engine is off - as is the case when towing - then you need to install a relay to ensure that the lights on your towed car always act in accordance with the signals sent by your RV via the wiring harness. Without a relay, the brake signal from your towed car will override the turn signal sent by your RV when you slow down to make turns, creating a potential hazard. Today we're going to review part number HM-56204. This is the Hopkins custom taillight wiring kit for towed vehicles. This part includes everything shown here on the table, it will include the wiring harness with the converter and the T-connectors and the length of wire with the four-way and the dust cap all included. 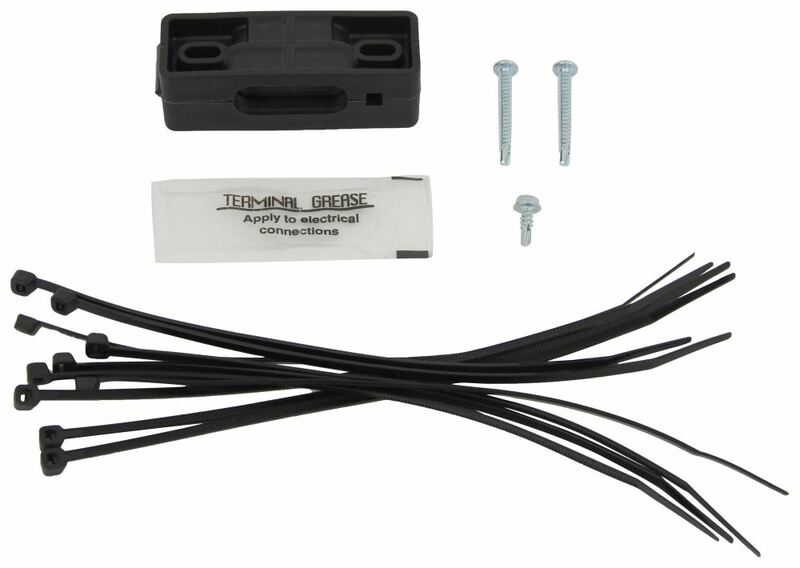 The mounting bracket and the installation hardware for the four-way are also included, a ground screw for connecting the ground, some cable ties for taking up any slack in the wiring, or for mounting the converter box, and also a nice package of dielectric grease to apply to all your electrical connections. 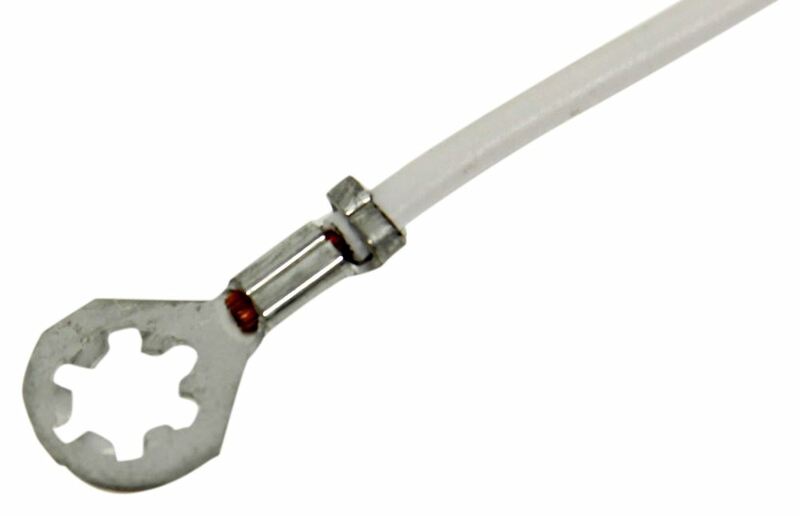 This part will let you wire your vehicle to accept your RV's tail, brake, and turn signal lights for flat towing. 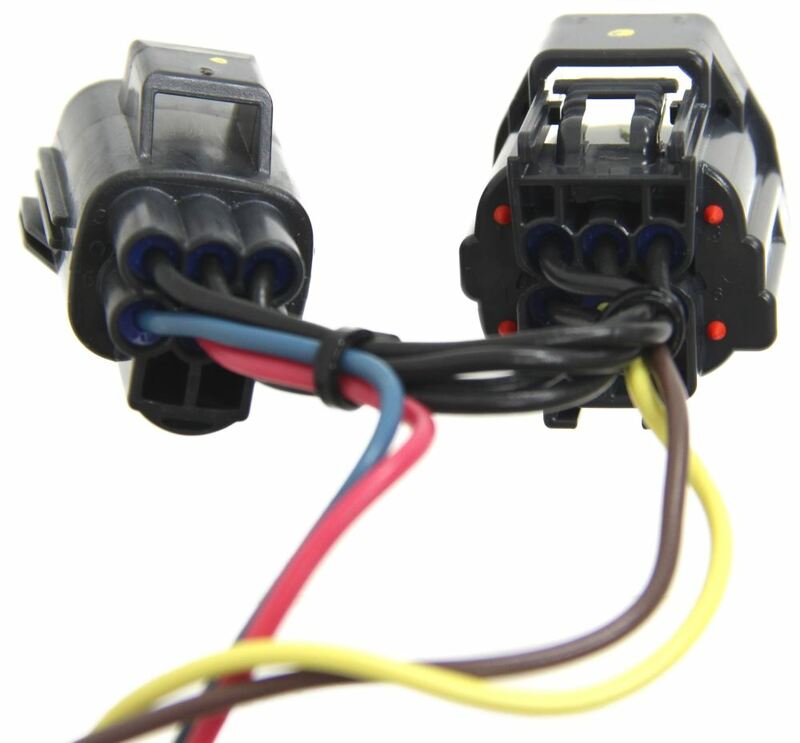 This wires the towed car as a combined system so that the brake and turn signals will travel along the same wire, and it provides this four-way flat plug at the front of the towed car to connect to your motor home. When you install this it does plug in quickly and easily, there's no cutting or splicing of wires. 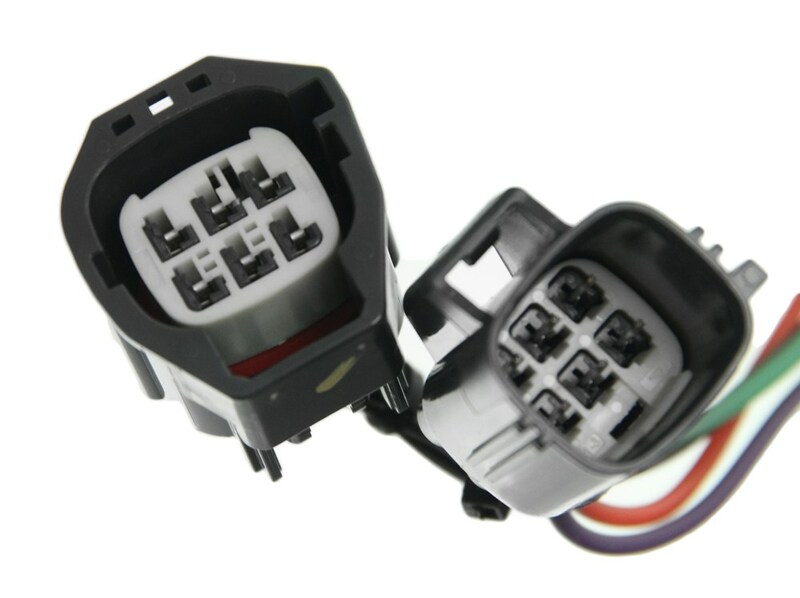 It uses these T-connectors, this to go to the passenger side with the green wire, the yellow wire is for the driver's side, you just plug these inline to the wiring harness. The connection point is usually located on the vehicle's taillights. 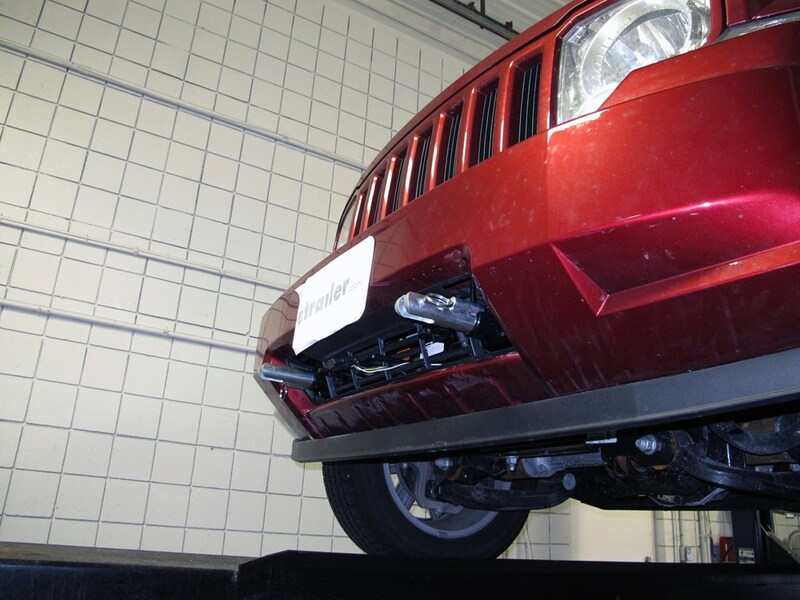 The converter right here, this will prevent electrical feedback to safeguard your towed car's electrical system. This converter has a weatherproof box that will help keep the built in diodes protected. 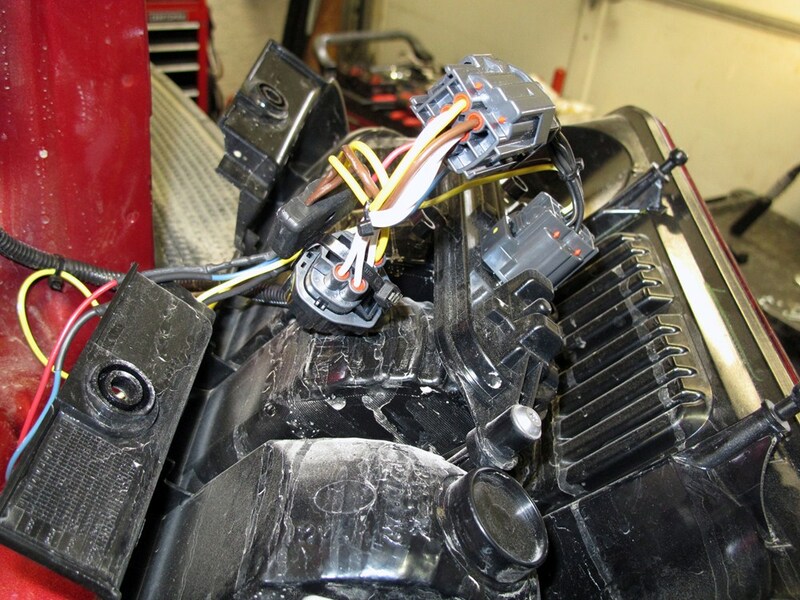 This part won't interfere with your electrical system when the towed car is not hooked up to an RV. It is custom designed for your vehicle. We do recommend to use with this at the front your car. You're going to need to plug this four-way to your RV, so we do require an extension loop for connecting this towed car to the RV. We do sell those separately on our website, they are listed as a related product. One of them is a HM-47115, and it again is listed on this product as a related product. 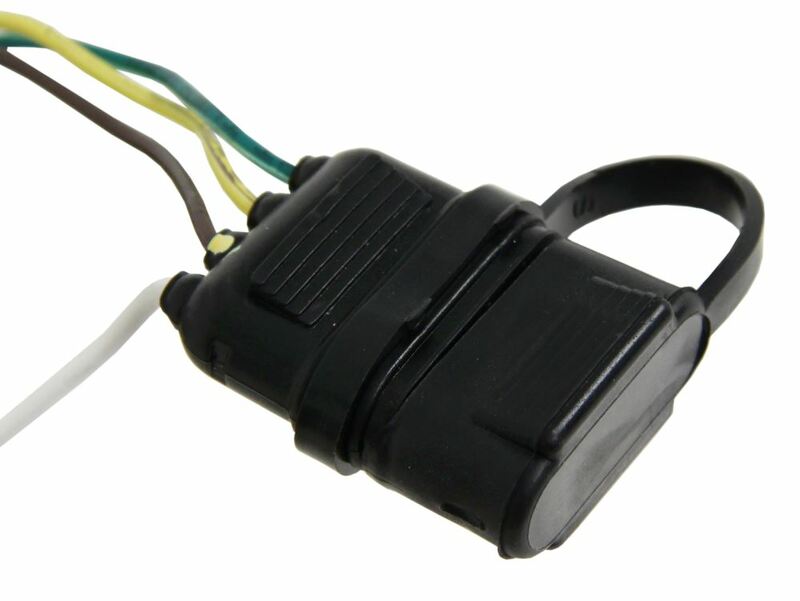 Now, you do want to remember that because this harness will wire your vehicle as a combined system, you might need a brake light relay if you use a supplemental braking system in your towing setup. 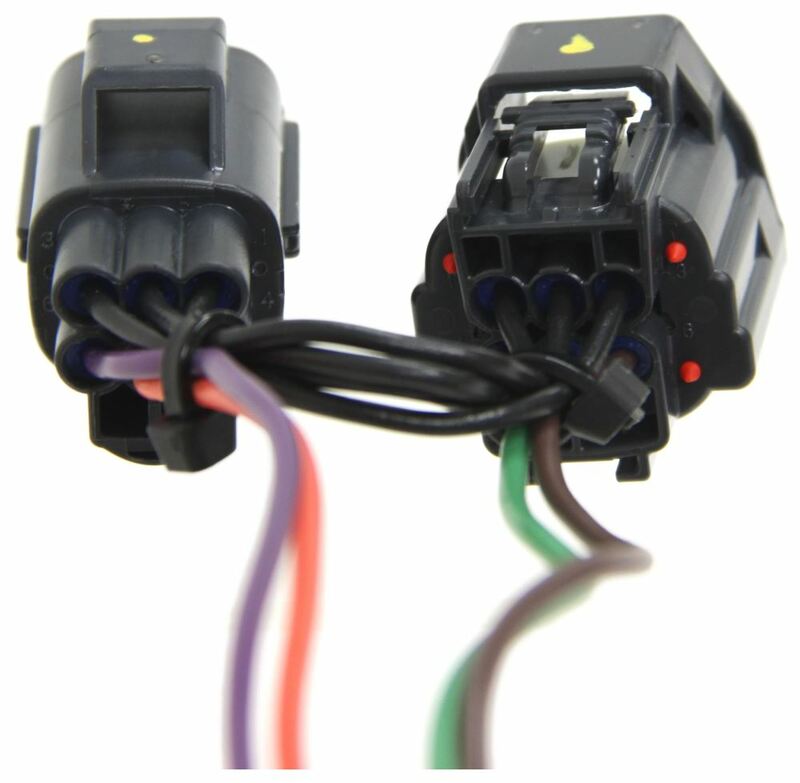 We do again sell that separately on our website, and again it's listed as related product on this product page, it's part number RM-88400, and the relay is used to ensure that the lights on your towed car will always act correctly with the signal sent by your RV using this wiring harness. Just briefly, how this would install. What you'll do is go tot he back of the towed vehicle behind the taillights, and these will plug inline. You unplug the wiring harness from the taillights and plug these in, and as I mentioned, the yellow wire will signify or designate that this is the driver's side, the green wire is for the passenger's side, so you plug those in. Your converter, you probably want to attach to a nice flat surface so it doesn't bounce around. You can use the cable ties to run through here to hold it into place. Then this length of wire here, you'll run this up to the front of the car and your four-way will be positioned at the front. Again, it includes this nice mounting bracket and the hardware that you can install at the front to hold the four-way into place. Once you get this to the front, you want to take this length of white wire with the eyelet on it, that's for ground. You do want to make sure this is grounded. If there's one nearby that you can use, go ahead and use it, if not, they give you a grounding screw that you can drill a hole and make your own ground. Then, again when you make your electrical connections you might want to put a little bit of the electrical grease on there to help prevent any corrosion. Once this is all installed then you'll be able to plug this right into your RV, and your lights on your towed vehicle will work inline with the RV that's towing it. But that should do it for the review on part number HM-56204, the Hopkins custom taillight wiring kit for towed vehicles. Order: RelevanceNewestRating - High to LowRating - Low to High Wire your vehicle and get the signal lights required for flat towing without having to splice into your wiring with this custom, plug-in harness. Integrated diodes prevent feedback from RV for safe operation. Wires as combined lighting system. Thank You for the follow up that means a lot about you company in how youcare, another reason why I like to deal with your company. GREATCUSTOMER SERVICE! ! ! ! Still love them all working GREAT!!! Do you have a question about this Tow Bar Wiring? The Hopkins # HM56204 is a plug-and-play wiring harness that contain diodes to prevent feedback into the tow vehicle's wiring system. 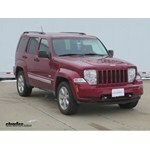 The harness would use the taillights of your Liberty like a combined system. When the vehicle's being flat towed, the red taillights will act as the stop, turn and brake lamps. When the Liberty is unplugged from the RV and driven normally, the taillight system will operate as usual. Do you want to bypass the converter because the RV uses separate turn signals and brakes lights like the 2012 Jeep Liberty or for some other purpose? 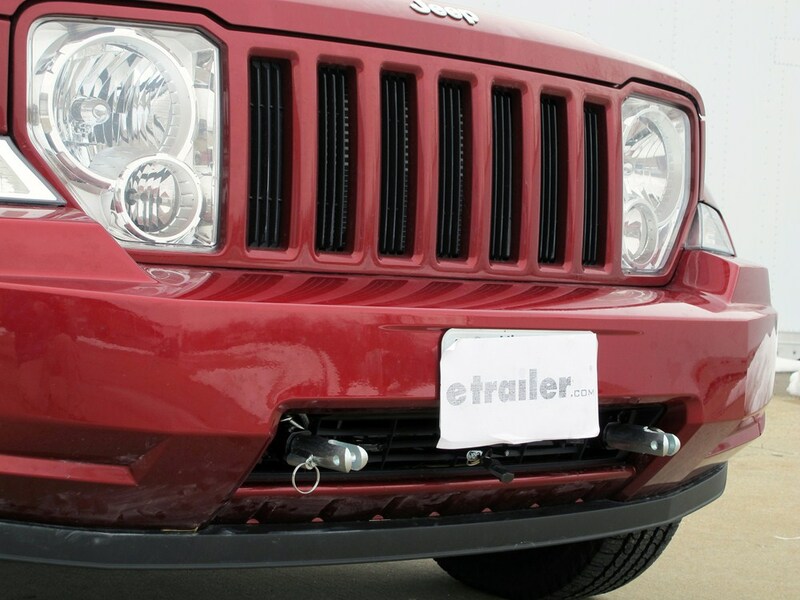 The converter box in a tow bar wiring harness such as # HM56204 takes the separate turn signals and brake lights used by the Jeep and combines them. It also offers circuit protection so bypassing it would not be a good idea. If you want the Jeep turn signals and brake lights to be separate you would need to use the 6 diode kit # 154-792-118158. Highest quality tow bar wiring for the best price. 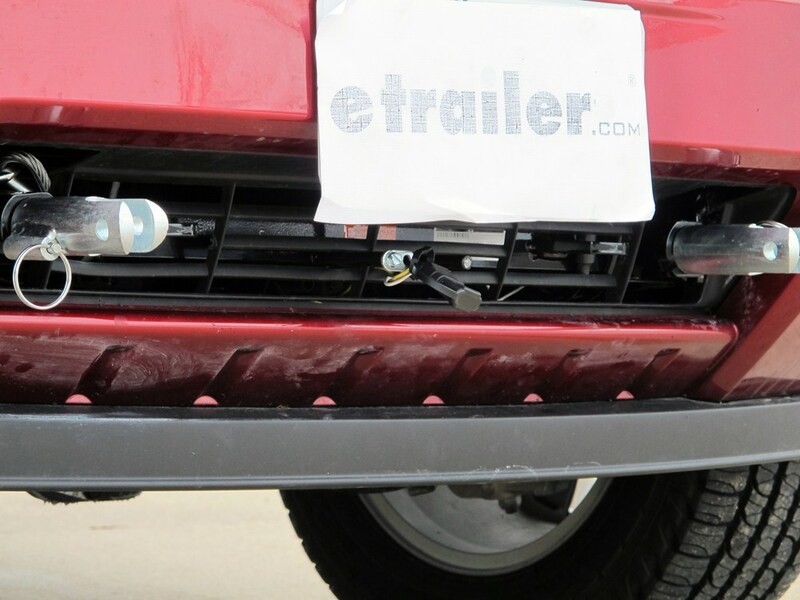 Most detailed, accurate tow bar wiring information available.